A very special event is coming to the beaches of Southern California next month. If it goes well, it could put the wheels in motion to bring legitimate professional roller derby to the United States. And it comes by way of Japan, via its high-speed, high-octane version of the game. On the weekend of March 19, the Rollergames World Series1 will pit the USA against Japan in banked track battle played in the Roller Game Japan style of roller derby. 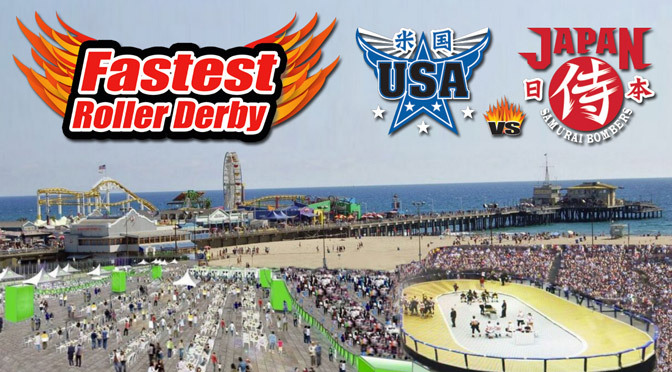 The game will be the showcase of a larger festival, Roller Expo 2016, that will feature roller dance demonstrations, a cosplay contest, food trucks and vendor booths, and even a pair of exhibition games put on by the L.A. Derby Dolls. Looking to make a big splash and going for maximum exposure, the expo will take place on the beach next to the iconic Santa Monica Pier. The banked track and bleachers will be erected in the adjacent parking lot, which will no doubt attract the attention of the tens of thousands that visit the pier and surrounding beaches on any given weekend. An artist’s conception of the setup of the track and festival in relation to the Santa Monica Pier, taken from event planning documents. This will mark the first time in more than 20 years that the U.S. and Japan have played in such an event, the last time being 1995 in Tokyo. The Japanese style of roller derby, also known simply as “Roller Game,” was devised in 1988 as a legitimate flat track version of traditional roller derby with unique rules. (For example: Every jam is a power jam , with teams alternating offense and defense each time up.) It quickly gained popularity through the early 1990s, and culminated in the original U.S.-Japan Roller Game World Cup. The man behind the event is Hiroshi Koizumi, the inventor of the Japanese variation of the game, life-long roller derby skater2, and ambassador of roller skating in his native Japan. We profiled Koizumi and his style of game on this website three years ago, just as he was starting to bring back Roller Game in his Tokyo roller rink. In late 2014, he built a monster banked track to begin training a new generation of Japanese skaters in the ways of high-speed derby. 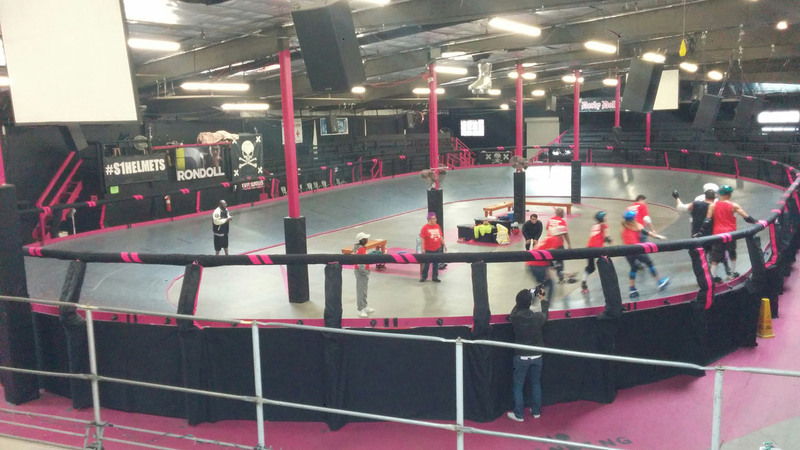 With Roller Expo and the Rollergames World Series, he’s laying the groundwork to try to expand his efforts into the United States. Since at least last year, Koizumi and his team of veteran roller derby pros have been scouting potential players, men and women, to be a part of the USA team he is building specifically for this series. Roller Derby Notes first met Koizumi at RollerCon in Las Vegas last summer. There, he explained to us that he hopes the event next month, and potential annual events in the years following, will be just the first step of a broader plan to potentially launch a new professional roller derby league in this country, played under his more straightforward rules. Most everyone involved with the scouting, training, and production of this new effort was a part of the traditional—and at times, theatrical—roller derby of the the 1960s, 70s, 80s, and beyond. In spite of this, the principals are stressing many times over that this time around, they want to play the game legitimately, with no set plays or over-the-top theatrics. Of course, fakery of any kind is a toxic commodity to the modern roller derby community. Just the fact that skaters of past eras are involved with this project has created a little bit of tension between the generations. This was apparent to us as we sat in on a brief training session in the Dolloseum, home of the L.A. Derby Dolls, earlier this month. Larry Lewis, Gwen “Skinny Minnie” Miller, Dave Martinez, Koizumi and other greats from a bygone era were putting skaters through their paces. There were only a handful of them in this session, but it made for an eclectic mix of old derby and new derby. On February 6, the L.A. Derby Dolls hosted a private session for Koizumi and his staff for a tryout and training session for interested skaters. LADD recently confirmed their participation at Roller Expo next month, which will include a juniors exhibition game. Present at the session was Stacey Blitsch, she of the early 2000s TV show Rollerjam. We also spotted a few modern-era skaters from the San Diego area, notably Slamurai of the San Diego Derby Dolls and Lambo R Feeties of the MRDA’s San Diego Aftershocks. Though they weren’t at this session, we’ve also been hearing names like Tony Muse (Your Mom Men’s Derby) and Mark Weber (Tink of the Cincinatti Battering Rams, also a Rollerjam veteran) as possible participants for the USA team at the World Series, on top of them both being members of the modern Team USA. The final selections for the USA team, which will have men and women on it in equal representation—as is traditional in roller derby—will be announced in the coming weeks. We expect to soon learn more about the Japanese team as well. It will all culminate in what promises to be an extremely interesting, and possibly historic, couple of days under the (hopefully!) bright and sunny skies of Santa Monica. 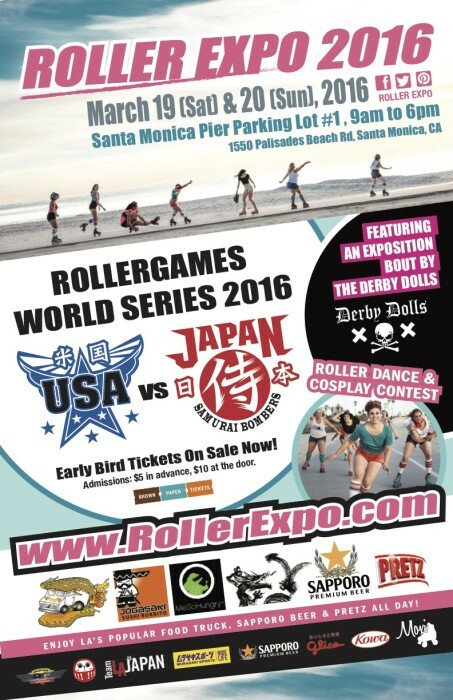 Admission for Roller Expo 2016 and the Rollergames USA-Japan World Series starts at only $5 when bought online in advance. VIP seating and cabana options are also available. Tickets and more information about the event can be found at their website, rollergames.us, and on the Rollergames: New Generation Facebook page. And if you’re interested—nay, intrigued—about the Japanese style of roller derby, including its rules and its connections to the modern game, check out our profile of the Roller Game Japan League from our Another Derby series of articles, and the RG Japan section of our video seminar, about the sport’s 80-year history. Roller Derby Notes will be in Santa Monica next month to follow the action. To be honest, we’re just as curious as you probably are about this, and whether or not it will be as successful as the organizers are hoping it will be. But one thing is for sure: There is a ton of potential in this thing. We’ll be watching to see just how much of it can be realized. I watched the 1993 video up until the kick to the face. This is not Roller Derby, this is professional wrestling. I love Roller Derby. I HATE injury. If this is what it is all about I don’t want it. I wonder if HotRod or Thunders wold be interested or would they fall in line with #WFTDANation in rejecting this expo game? Not to be confused with the theatrical version of the game played in the 60s and 70s, or the TV show with the alligator pit. This is something entirely different. Refer to this post on our Tumblr blog, Scratchpad, to get clarification on where this new version of “Rollergames” fits in. He started skating professionally when he was just 15 years old! He’s also in the above video, #17 in red.